I am very pleased to be able to share a treatise on the monochord by Bhishma Xenotechnites, an extraordinary musician and scholar, who has been my teacher and friend for almost 40 years. I have previously called attention here to several compositions of his as well as a major book on singing classical Greek epic, lyric, and dramatic verse. 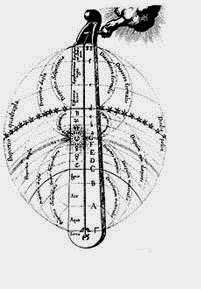 This new essay, Monochord Matters or The Power of Harmonia can be understood as a report on how an ancient and simple instrument, the monochord (or, classically, Kanon) — essentially a stretched string with a bridge somewhere along its length — opens up a world and a worldview, the part of the quadrivium we usually call music, but more precisely known classically as harmonics, the art/science that begins most concretely — physically and sensually — in the realm of the rational. The author wisely keeps the balance, no, the tension, between perception and reason which is the central dynamic of the enterprise, unresolved. A PDF of the text is available here, as well as at the link provided by Charles Shere, whose item on Monochord Matters is worth reading.